You might be wondering about the title of this post. Well... we did, in fact, purchase two turkeys. Now we know to buy frozen turkeys way ahead to let them thaw. Or buy fresh. Learning experience. I mentioned on twitter about all the beautiful table settings. Here is a photo of our table set and ready the night before. We don't have much dishware and silverware, so I am very excited to register for all that stuff for our wedding. 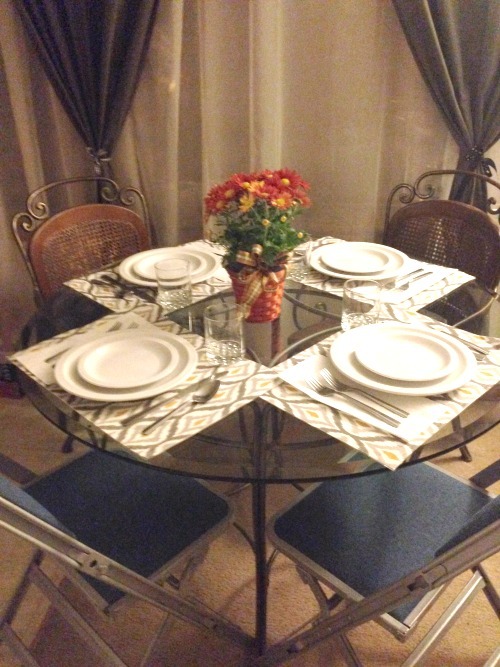 Then I'll be able to set gorgeous tables that are larger than four people! We had a delicious meal of turkey, mashed potatoes, corn, roasted brussels sprouts, stuffing, and gravy. So not healthy, but SO delicious. We were joined by Dave's mom who flew in from Rochester, and our good friend Andrew who lives in the area. For dessert I baked a bourbon pecan pie. Recipe soon to follow. For our first time as holiday hosts, we learned many things. You should always make a list when you make your grocery shopping trip. Roll with the punches, because things will go wrong. People will think it is delicious anyway. And the best part isn't the food, it's the company you share it with. I think it looks gorgeous! 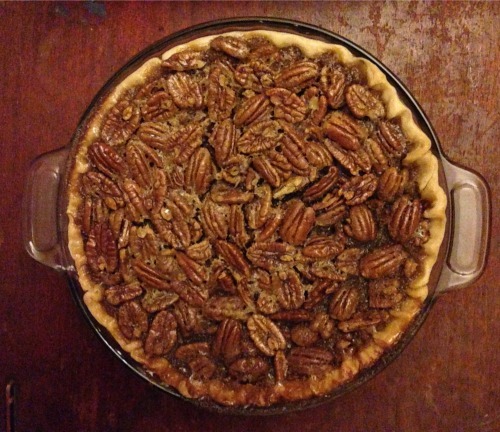 And I can't wait for the bourbon pecan pie recipe- my mouth is watering! Glad you guys had a great Thanksgiving!